When visiting Philippines, it would be a shame not to try the most famous adobo, lechon or national breakfast called tapsilog. Yes it would be a shame… unless you are a vegetarian. Then, you don’t stand a chance to get a taste of Philippines’ national dishes as all of them are meat based. 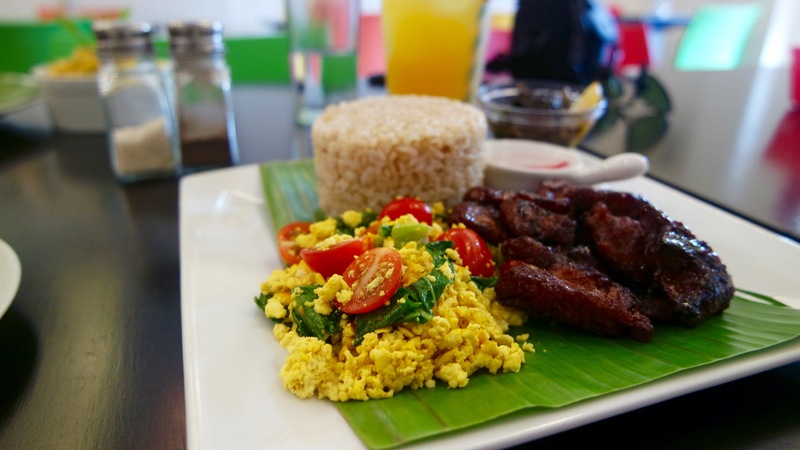 So when I came across the Vegetarian Kitchen on the internet, i felt like it could be my only chance to try the vegetarian versions of famous Filipino dishes. 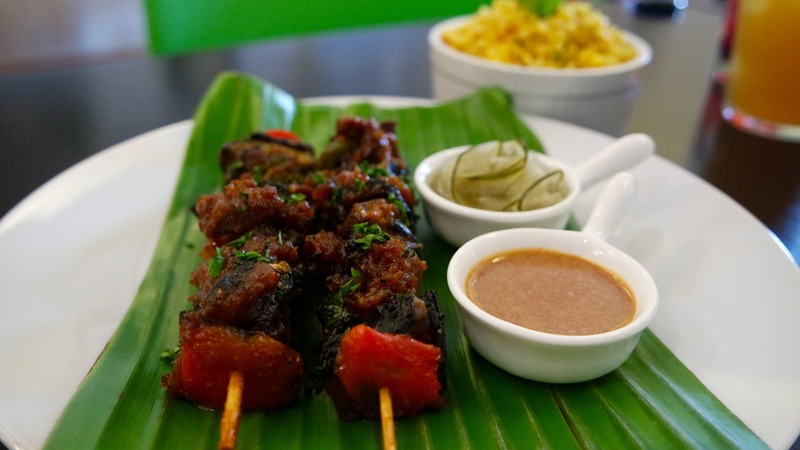 Located in Quezon city, Metro Manila district, the restaurant offers many vegetarian options including Tapsilog, Sate BBQ, Pork Tocino and Danggit. Thanks to Camille and her family I had the chance to try Tapsilog only scrambled tofu replaced with eggs and the Meat Magic (dehydrated soy) instead of Pork. Served with who grain rice and vinegar on the side, I was finally able to to enjoy a typical Filipino breakfast. 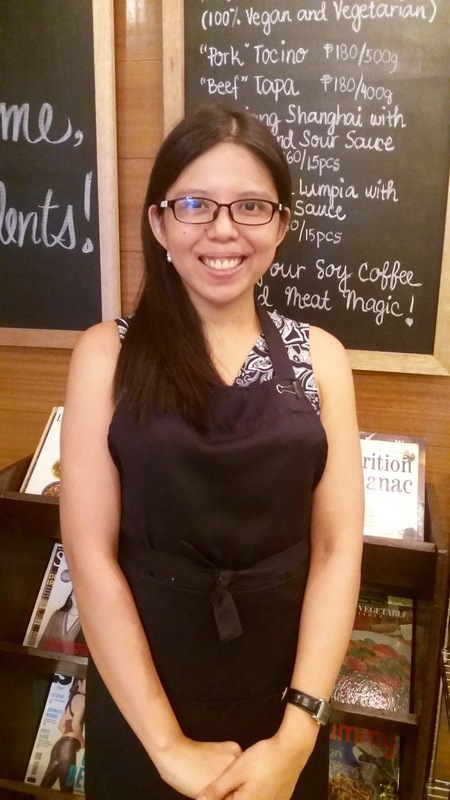 Founded in 2012 by Camille Soliongco Acosta, her mother and her brother the Vegetarian Kitchen is a family establishment. Belonging to Hare Krishna consciousness, the family already has a restricted diet in terms of animal products and the idea of creating the vegetarian versions of the Filipino dishes was a result of the family’s need to enjoy their own cuisine and still be vegetarians. Hare Krishna consciousness is originated from India and gained popularity in Philippines after the WW2. The members of this movement is barely 1% of the population where the main religion is Catholicism. The movement forbids to consume animal products including egg and fish. Camille, says that they are aiming to create a sustainable vegetarian diet to the members of this movement and other vegetarians. Most of the ingredients they use are bought from markets and they sell the Magic Meat in their restaurant for the ones who wish to cook themselves at their homes. She underlines the fact that if they use all “fancy” and expensive ingredients as quinoa, tofu etc. People would have the idea that being a vegetarian would cost them a lot and it won’t be sustainable for them. As Filipinos love their meat and don’t want to be deprived from their national dishes, offering them the vegetarian versions of them, seems to be a nice way of helping the transition period. They use wheat gluten and the Magic Meat (dehydrated soy) to replace meat and with the sauces they use, they create the exact replicas of the famous recipes. She says many customers tell that when they bring their family members who actually eat meat can not tell the difference until someone tells them what they have been eating. When it comes to the philosophical approach about vegetarianism, Camille and I differ at one point though. She thinks that if you are doing this only for “ethical” reasons, you are more inclined to cheat your diet but if there is a higher belief system behind the reason why you are a vegetarian, you would not want to cheat in the first place. I have to beg to differ on that topic. For me, there are no religious reasons behind of choosing to exclude meat products from my diet but a deep sense of respect to all creatures we are sharing this planet with and I don’t think I will be ever inclined to cheat as meat itself is not appealing to me one bit. When a behavior is a voluntary act, not a rule forced upon you, it is a choice only belongs to you. Whereas if you like to eat meat but can not because it is forbidden although you actually like to eat meat, you are more likely to be pushed from the cliff every once in a while in my opinion. To me this applies to all aspects of life. When you are doing one thing out of your own choice, the idea of doing it is not appealing a bit. When you are doing it out of restrictions, then eventually you may have a curiosity to go ahead and try even for once. Nevertheless, I was very happy to find the Vegetarian Kitchen to satiate my curiosity about Filipino cuisine without going off my dietary choices. 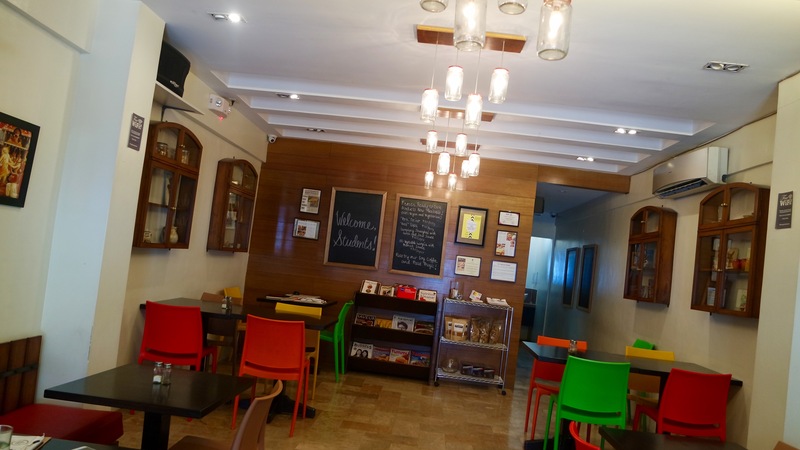 Whether you are doing it for ethical or religious reasons, the restaurant is offering delicious options with vegetarians and it is an oasis in the capital of Philippines for the ones who are looking for vegetarian dishes.